For those people who had met with this technology, may be underestimated on performance and how useful this braking system, whereas, basically braking system is one of the features of the vehicle that must be considered intensively. Braking system A.B.S (anti-lock braking system) or commonly called anti locked brakes are braking technology features that exist in automobiles and motorcycles to be able to perform the wheels locking when braking suddenly or braking very hard place, so that it can avoid the effects of tire slip. Some motorcycles are already applying braking system is the Yamaha R25 A.B.S and Kawasaki Ninja 250 Fi. A.B.S braking system technology at first are existing features on an airplane, but, today the developers of the technology braking system applies braking technology is the vehicle car and motorcycle. Basically, the work of the existing A.B.S braking systems on cars and motorcycles will occur if the vehicle suddenly brakes or the brakes do hard so that one of the wheels on the vehicle wheel stops spinning but the others are still rotating and pushing the vehicle, this incident could make a vehicle will lose balance and risk of accidents, however, vehicles equipped with A.B.S This will reduce vehicle speed and stop safely in contrast to vehicles that are not equipped with this feature, then the vehicle will lose balance could even bounce. The top had been discussed working together on the basis of the incubation system A.B.S. 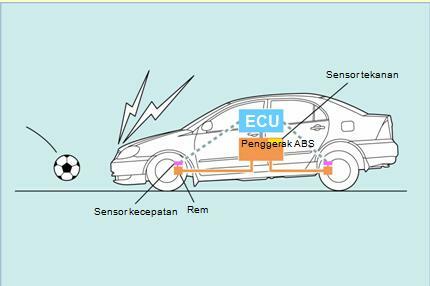 Thus, when the sensor of the technology the ABS braking system detects wheel locked, the system will provide a direct order to release the brake piston into the brake pressure to return to the normal point, after it mengeraskannya back so the wheel spins. The advantages of this braking system is the way he is so fast braking of the system penegereman commonly applied in other vehicles and also more stable in the event of sudden braking and pengendarapun will not lose control.